Facebook How to report hacked Facebook account to facebook admins to either recover or shut down the facebook account. The article l want to write about is a very delicate issue which has taken over the social media World. The way Facebook accounts and other social media accounts are been hacked and used by people we don't even know and most of the times they use it to do some dirty jobs which dent your image if you don't take important and immediate action to either recover the account or shut it down permanently. 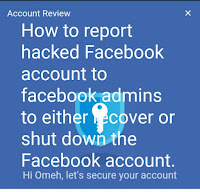 Today l want to write on how to report a hacked or compromised Facebook account to Facebook Admin so that it can either be shut down or recovered (l mean the hacked Facebook account). I have seen some Facebook accounts been hacked and at the end, the main owner of the Facebook account loses it to the hacker. The only solution he or she (owner of the Facebook account) has is to open another account and from it write a post telling people my Facebook account has been hacked, be cared so that you don't get duped and so on and so forth. Facebook Admins knowing quite well that something like this could and can happen at any time has also profaned solutions to tackle it when they occur. But they only problem is that maybe the owner of the hacked Facebook account may not know the necessary steps or action he or she should take in other to recover or shut down the hacked Facebook account. So let's look at how to report your account to Facebook admins when it's been compromised so they can take necessary steps to help you out. How To Report Hacked Facebook Account For Impersonation. The Facebook help center is designed to help us recover hacks Facebook account. 6: How to change your Facebook profile pictures without notifying or letting anybody know. 9: Negative effects of Social media on teenagers/Adolescents. 1. My Account is hacked. 2. I think my account was hacked or someone is using it without my permission. 3. I think my account was hacked or someone is using it without my permission. 4. How do I deal with Facebook spam? 5. My Facebook account was hacked and used to make purchases on apps. 6. What to do if you don't recognize activity on your advertising Facebook account etc. If it is your friends Facebook account that was hacked then follow this steps either. 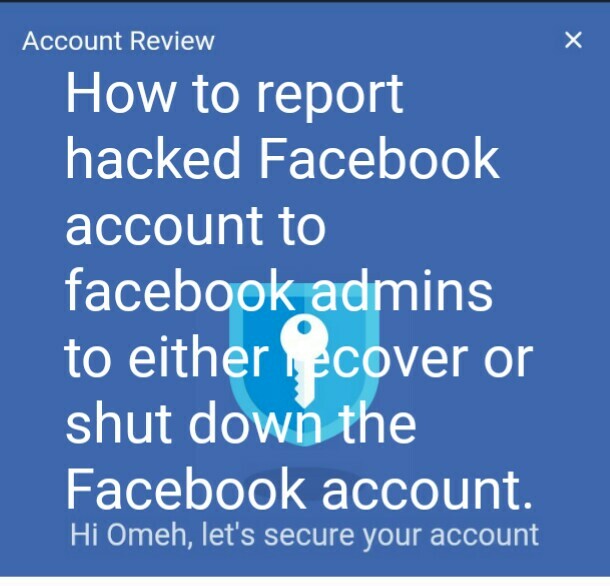 With this option, you can help your friend to recover his or her Facebook account by using your own account to recover or close the hacked account. If your Facebook account hack falls on the above issues go through the Facebook help center. For help on your Facebook account recovery. If it's your Friend's Facebook Account or Your Facebook Page that is hacked follow below process. My friend’s Facebook account is sending out spam. I think my Facebook friend’s account was hacked. I think my Facebook Page was hacked or taken over by someone else. Click on any other the options above will take you to another option follow the prompt option which will guide you on how to go about the account recovery. Click on any of the Features below and report your compromised Facebook account the process will help you recover your Facebook account. Click on any of the options from the picture above and follow the option that will come up next. It's an easy procedure to follow but in case you find out any difficulty you can let me know through the comment section and l will put you through. 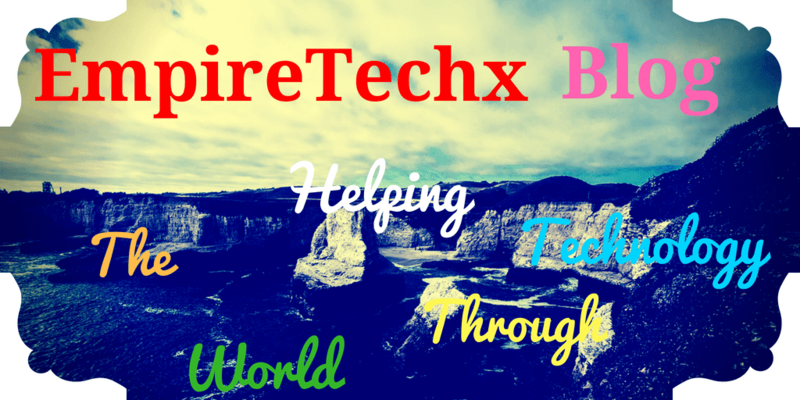 Thank you very much Empiretechx I follow you directions on this post and I was able to restore my Facebook account. Hi, my facebook account has been hacked. The hacker has changed my e-mail id( username) & password and also blocked all possible ways (e.g through mobile CODE) to Log in to my account. The e-mail id has been changed to ngw1vy5g8y2@kristinelowry21.com only to which all codes for password reset are being sent. How can I retrieve or delete my account? It's a pity, but its always better for one to protect is Facebook account from being hacked than trying to recover it. With the email and password changed it maybe near impossible to recover the account but you can report it for it to be closed. But if your mobile number is still on the account it can be recovered.